A full bowl of chunky peanut sauce with a light sprinkle of sesame seeds on top; but if this was vegetarian … then are you game for the Satay? Like a recurring nightmare, this would be the official third post in a row centering around wholesome, healthier foods. Talk about a change will do you good huh? This was incidental. Wait, could be accidental, since without my GPS, we got lost somewhere in Bandar Puteri Puchong. Or wherever this place was. Initially wanted to do Super Kitchen Chili Pan Mee all over again for dinner, with the sick intention of burning the roof of the mouth and sweating buckets before calling it a day. Then the ever reliance on modern device took a drastic stab at reality. Without the device, I could not make heads or tails of the whole area. Ended up further away than desired, and this vegetarian restaurant was the only place that was brimming with life. Seriously. Told ya this was like the light at the end of the tunnel. In this case, in an area so deserted, you could be getting the shivers driving here alone at night. Since we were game for anything at all, after aimless rounds around Puchong …. this place brought hope to the despairing souls. Hungry, wandering souls. 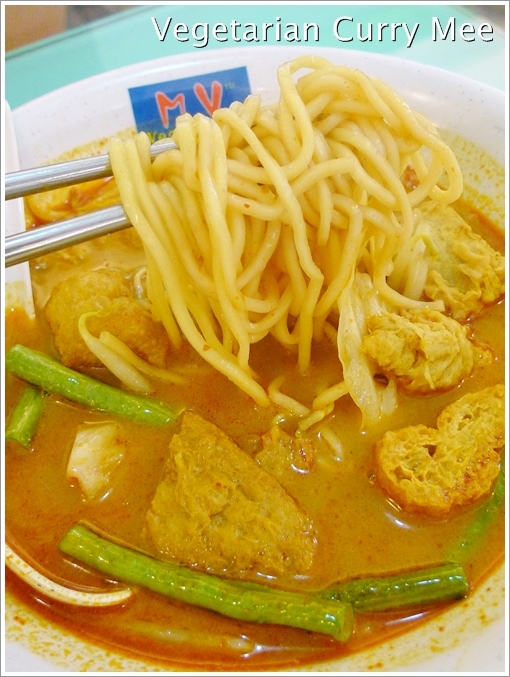 Vegetarian Curry Mee (RM6/USD2) – Don’t expect coagulated pig’s blood or cockles. 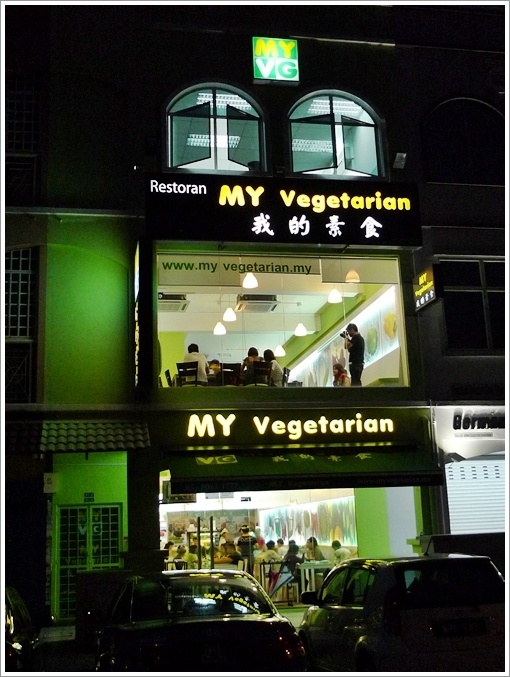 I half expected this place to serve vegetarian sushi, like how Fu Tien does. The green facade, the air-conditioned setting, and the modern ambience reminded me vividly of the same environment back in the restaurant I mentioned in Ipoh. A two-storey shop lot with an evidently bright and open concept (you can see the whole of the shop from outside), this is vegetarian cuisine at its most commercialized manner. Don’t get me wrong, I did not mean to belittle places like this. In fact, they deserve a pat on the shoulder for lifting the image of dreary and bleak vegetarian food to the masses. Even youngsters nowadays, whom I am sure will not be delighted at the thought of eating vegetarian food in monasteries! 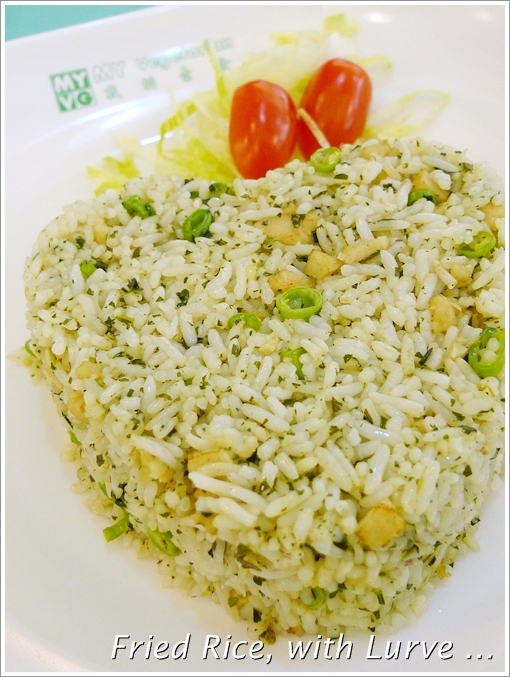 Xian Cun Fried Rice (RM6/USD2) – Fried with love, served in a tacky presentation. Bits of beancurd made up the fish cake like bits, and the finely-chopped French beans provided some textural contrast. The menu covered a lot of things; from dishes to go with rice, to individual meals perfect for smaller groups. Or you could be itching to try everything at once. I wouldn’t go all out to heap praises on the curry mee, or the fried rice. Since both were passable, yet did not justify the recommendations (theirs, as highlighted in the menu) nor the price. The fried rice was slightly cold, not even lukewarm in fact. But was tasty enough to require no condiments (no sambal, no cili padi, in case you’re curious). Satay (RM8.50/USD2.80) – Vegetarian ones, that were surprisingly tasty enough with robust marinade, yet 5 sticks for that price sounded exorbitant. But you do get ‘ketupat’ by the side. Only saving grace was probably the Satay, vegetarian of course. We tasted the usual turmeric-infused marinade with a slight charred aroma from the grill. 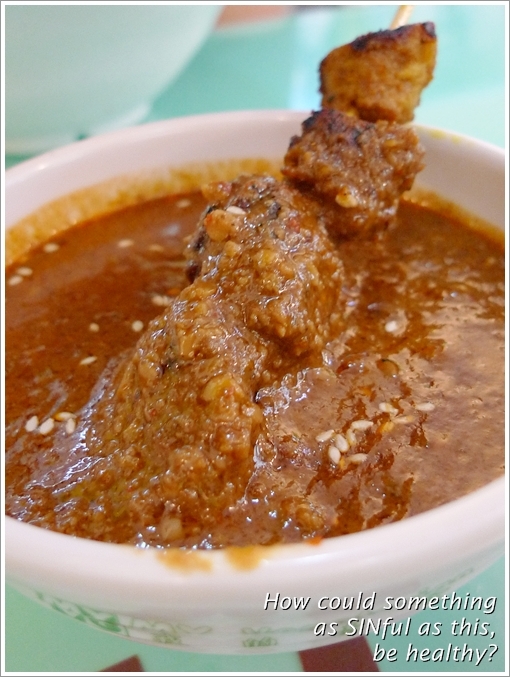 And the peanut sauce though not as enticing as Kajang’s absolute best, but still was good enough and we ended up walloping almost half the bowl. 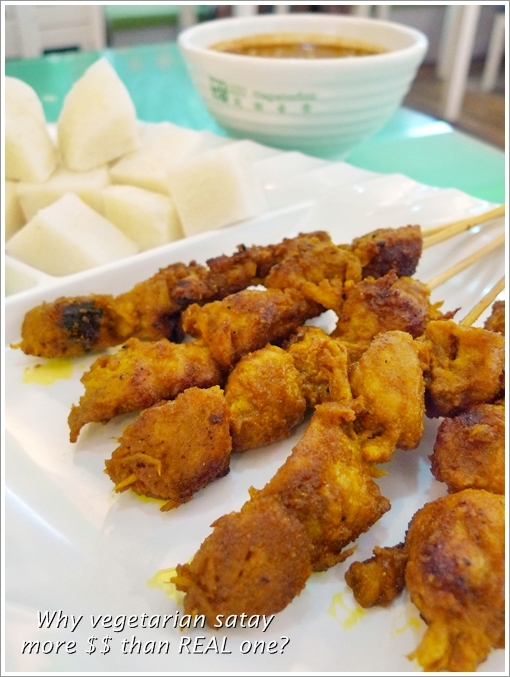 With the blocks of ketupat and cucumber/onion sides, and even deliberately pouring on the fried rice for extra oomph. And moisture. 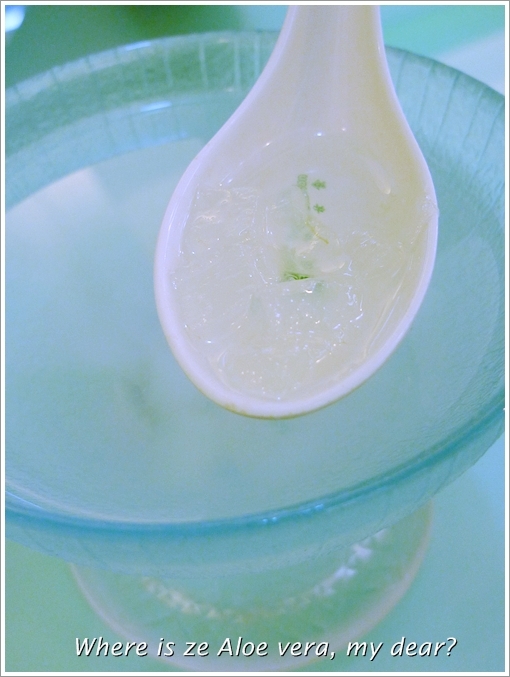 Organic Aloe Vera with Lemon Juice (RM4.50/USD1.50) – Forget bout this, the water tasted like a squeeze of lemon in plain water. And the bits of aloe vera did not warrant an order for this. 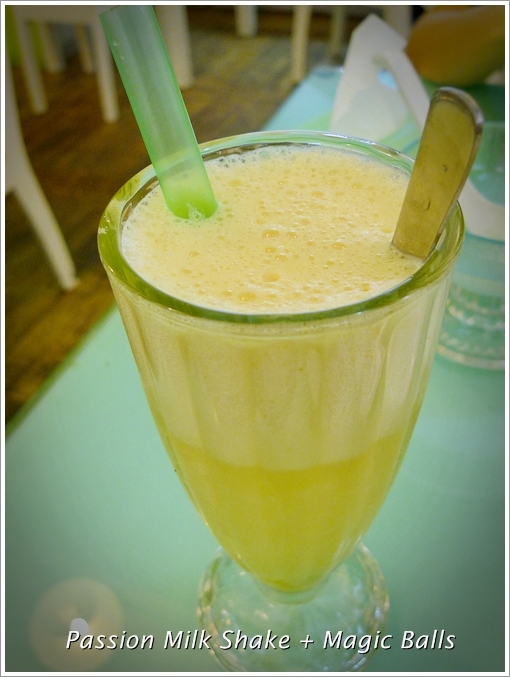 Passion Milk Shake with Magic Balls (RM5.50) – This was slightly better, with a punchy/tangy flavour from the passion fruit flavoured beverage, and chewy balls (the ones used in Taiwanese beverages) for extra measure. But half the glass was bubbles/foam. And I slurped this up in mere minutes. All in all, as crowded and famous as this place might be, I don’t see myself craving for more in the short term. They have two other outlets in Klang Valley; one in Seri Kembangan while the other’s in Klang. A modernized, contemporary mean to savour interesting vegetarian cuisine. Especially if you’re growing tired of the same old vegetarian roast goose and bland greens stir-fried with greens in the usual stalls.If you’re a fan of MYVG, do share with the others here on what to order, and what not to. I spied a plate of rather tempting fried mushrooms beside our table, though the batter-coated, deep fried sensation somehow tarnished the original intention of eating healthy huh? the rice look like half cooked, doesn’t look tasty. so ‘lup lup’ one. i think vegetarian food are more unhealthy as those flour made / artificial meat soak up more oil than the real ones except for those real vege. will more food colouring and flavour used since vegetarian food are substitute of the real meat?